I had a sheet of Puff Pastry in the freezer left over from the Cinnamon Churros I made a couple weeks ago and I’ve been wanting to do something with it. I just got my January-February issue of Taste of Home Magazine, it’s annual iron skillet issue. 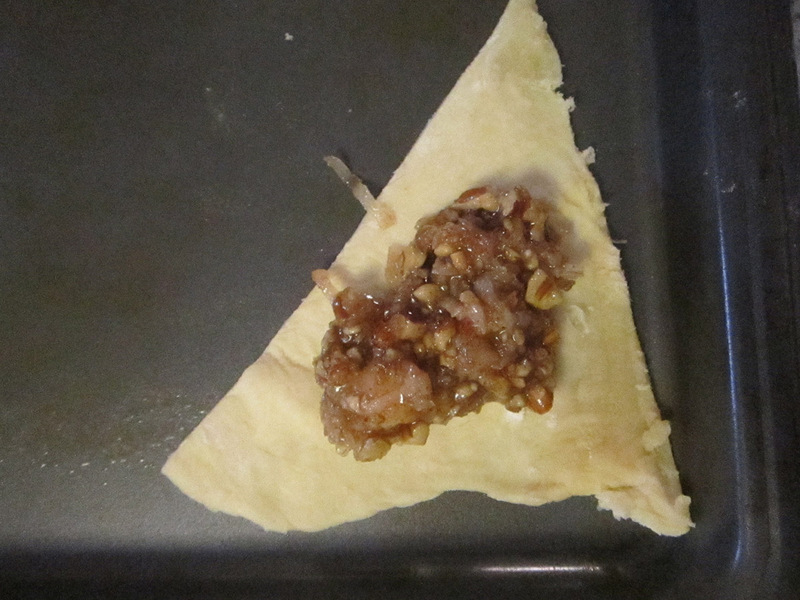 On page 60 there is a recipe for Coconut-Pecan Pie Wedges made with refrigerated pie crust. My husband loves pecan pie and, of course, in the title to that recipe is my favorite word, “Coconut”. I’d looked online for puff pastry recipes and actually found several recipes for baklava, but I’m not crazy about honey. Honey and Peanut butter and Bit-O-Honey. That’s about as far as I go when it comes to honey. 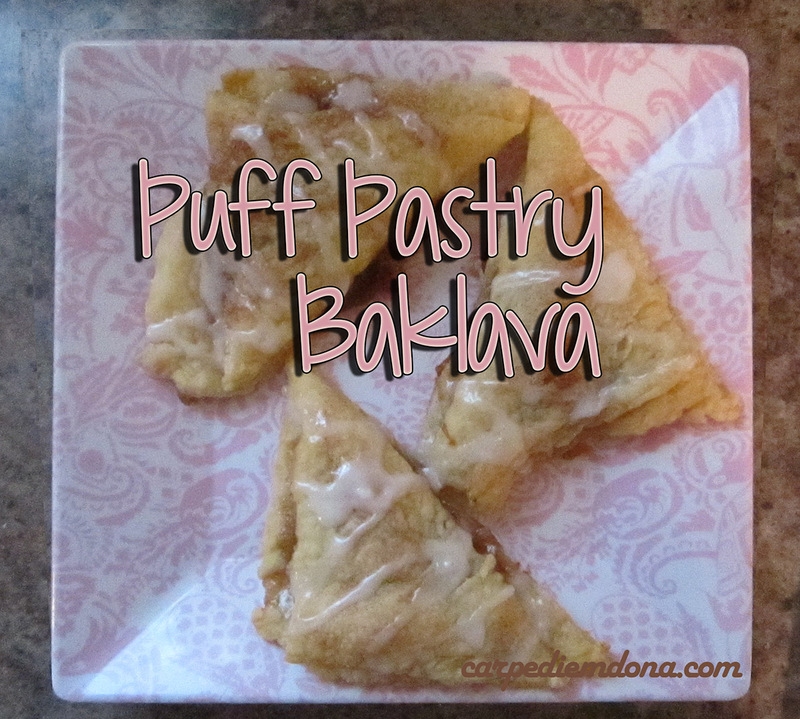 I decided to combine parts of both recipes and came up with my version of Puff Pastry Baklava. Before you get going, preheat the oven to 350 degrees. I rolled the pastry dough out on my floured counter top and cut it into wedges (very carefully, that is a brand new counter top). You could probably just cut it into squares and fold over and it might work even better. 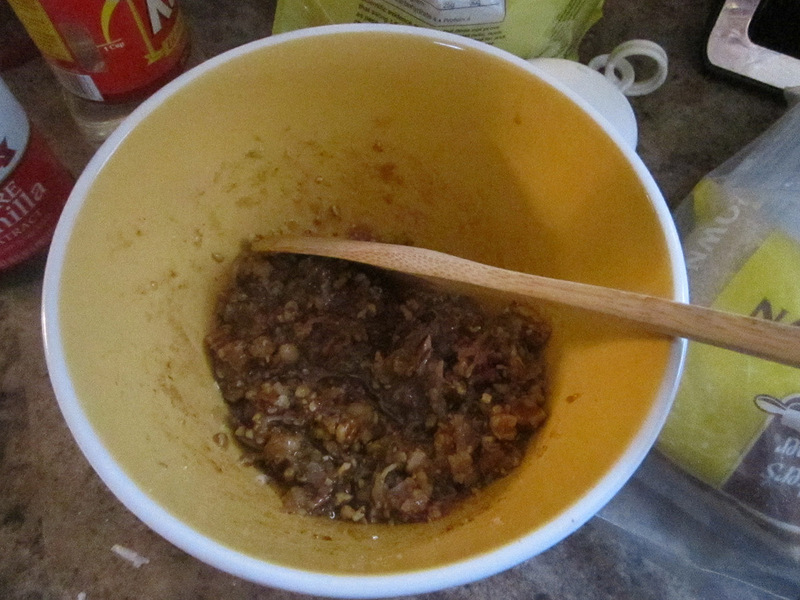 Fill one triangle with a heaping tablespoon of the nut mixture. Place another pastry triangle on top and moisten the edges to seal. Crimp the edges together. As you can see, I could have done a better of job of crimping my edges. 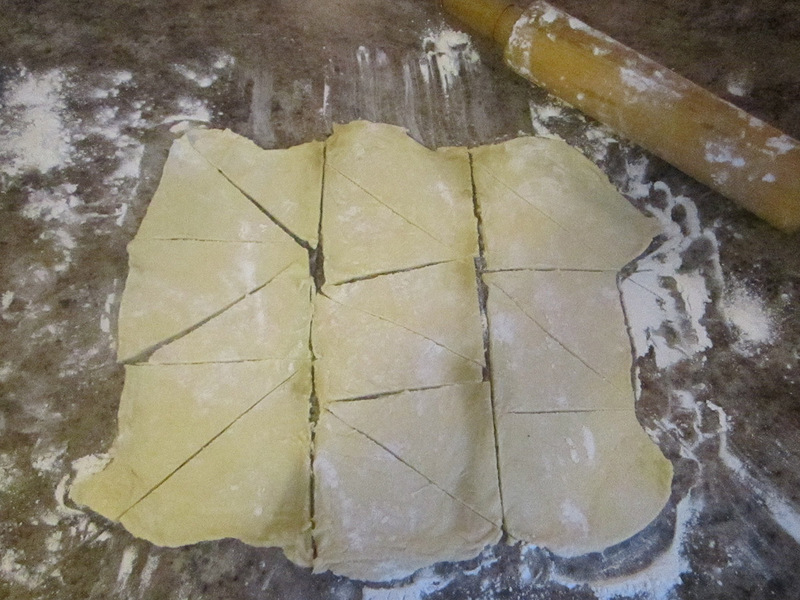 Cutting the pastry dough into squares and folding into a triangle would probably be a better bet. 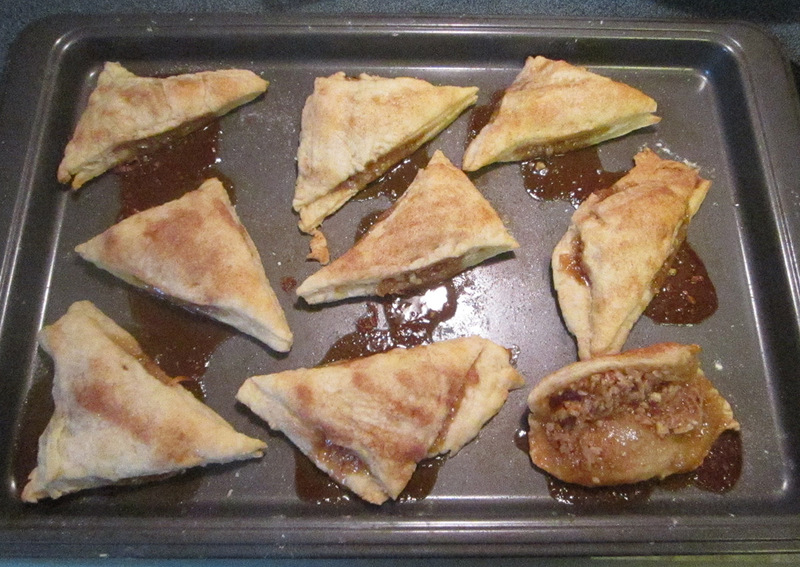 Moisten the top of the triangles with water and sprinkle with cinnamon sugar if desired. Bake in 350 degree oven for 20 minutes or until browned. Mix the 1/2 cup of powdered sugar with 1 tsp. of milk to make the icing drizzle. You can adjust the amount of powdered sugar and milk to meet the consistency you want. Just remember, a little bit of milk goes a long way. 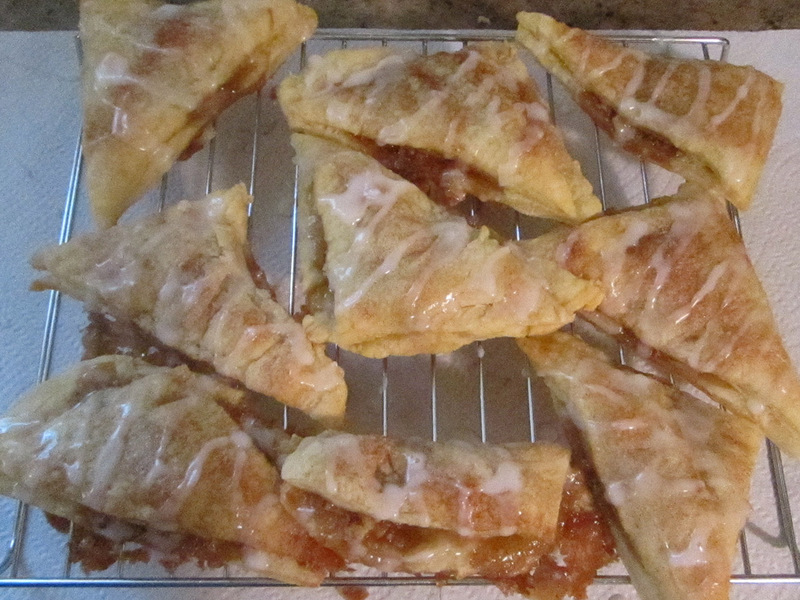 Using a spoon, drizzle the icing over the pastry triangles.